There’s a war raging between two rival and popular cryptocurrencies on CoinMarketCap, and it’s interesting to see just how resilient these coins can be. The tug of war is between Cardano and Tron, both of which have been in the news lately. Before the swords were drawn, Tron stood at position 10 while Cardano sat at position 11. However, it seems like Cardano is no longer interested in living outside the coveted top 10 membership. Tron, on the other hand, wants to keep its seat. That’s how the battle of the positions started. Early on the 23rd March 2019 (Yesterday), Cardano woke up with its sword drawn, taking Tron by surprise. 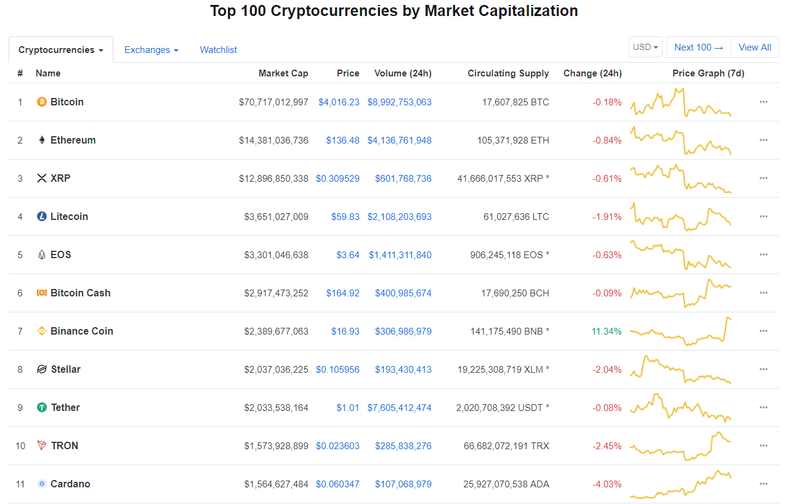 The consequent 8% bullish rally saw Cardano unseat Tron (TRX) from the 10th position to become the last member of the top 10 charts on CoinMarketCap’s list of the largest cryptos in the market. Despite putting up a strong defense for its new position, Cardano couldn’t hold the line for long as TRX came back with a vengeance, pushing ADA into retreat and reclaiming the position. It took a few hours of intense tug of war to arrive at that. During this time, Tron shot up by around 5%. The events of the 23rd March are still obscure to some. One factor that contributed to the ADA surge is its recent release of the upgrade to the Cardano 1.5 on the Cardano mainnet. The release scores some good level of importance given that it marks the last upgrade within the development phase known as Cardano Byron. The second factor is the follow-up release of the upgrade dubbed Cardano 1.5.1. This upgrade is meant to fix issues in the network’s protocols involved in data migration and log rotation. Granted, the two upgrades attracted much attention that ultimately led to the big price rally and eventually Cardano’s sojourn into the top 10. Also notable is the increase in the crypto’s trading volume. At the moment, data from CoinMarketCap indicate that Tron has since knocked out Cardano from the 10th position, again. Cardano now sits at position 11 trading at around $0.060 and posting a market cap of about $1.564 billion. Tron, now at position 10, trades at around $0.023 and posts a market cap of about $1.573 billion. Whether it will maintain its position in the days to come remains to be seen.